To start off our week of Spanish language learning resources for (non)homeschooling parents, I’m pleased to introduce you to MommyMaestra’s newest sponsor, PetraLingua.com. 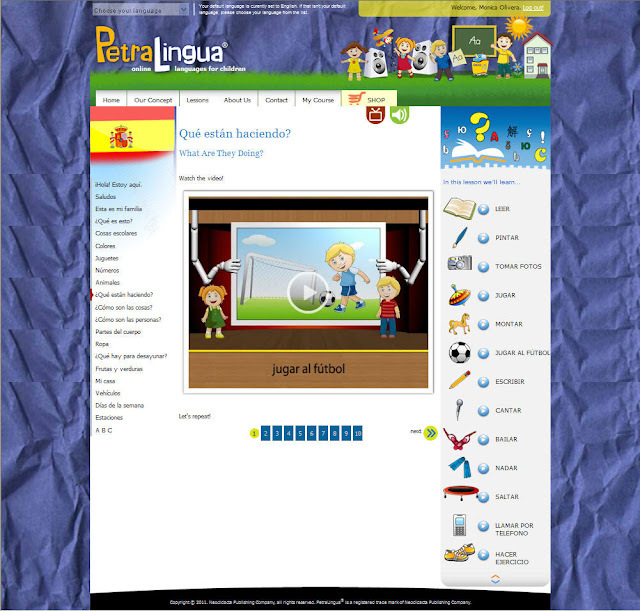 PetraLingua is an online language course for kids ages three to 12. The courses cover the curriculum of the first two to three years of foreign language learning at schools, and are an great choice for homeschoolers, as well as for classroom use. The program works on Windows, MAC, iPad, iPhone, as well as on Android tablets and phones. • After logging in, your child has the option of starting where she left off the last time she was online, or starting at the beginning of the course. • The lesson page lists all the lessons on the left so that your kid can go back and review something if he has forgotten it. • On the right side of the page is a list of all the key words or phrases that your child will learn in that lesson. I especially like that there is an icon or image to accompany the word for younger children who cannot read very well, yet. AND they can also click on that word/phrase and hear an audio clip of how to pronounce it. You do have the option of hiding the words if you prefer to do so, simply by clicking on the image above them. • The parts of the lesson occur right in the center of the page. There are usually at least 10 (sometimes more) activities involved in each lesson: It begins with a short video that introduces all the key words and phrases, then it involves a lot of repetition by asking the child to watch additional videos and repeat the phrases after the beep. These are followed by exercises in which your child listens to an audio clip and selects the correct image to accompany it from a multiple-choice selection. There are also exercises with true or false questions, matching, and one where the children click on the right answer based on the image and/or audio clip. • My kids enjoy the colorful images and the characters…especially the little dog barking at the beginning of each video! My Kindergartner loves his online time with PetraLingua. But he is a little too young to read all of the interactive exercises, so I need to sit with him for those and help him work through those particular exercises. He's okay on his own with the videos. My 2nd grader can easily navigate the system on her own. She finds it equally engaging. NOTE: All of the audio is done with a Castillian accent. Some families prefer this, while others don’t. I don’t mind this seeing as how my father is from Spain, so if my kids pronounce their c’s and z’s with a "th" sound, I’m good. Otherwise, I would just explain to my child the differences in pronunciation found in the Spanish-speaking world and repeat the word the way I want it learned at the time it is said. It is worth noting that there are very few words that this changes – "estaciones" and "haciendo" are the only two I noticed. If you'd like to see a sample of a lesson, just visit their site and click on the free lesson preview for the language of your choice. PetraLingua can work as a stand alone curriculum, or as a supplement to help reinforce concepts your child is learning at school or at home with another curriculum. It provides a fun opportunity to learn with technology in a safe manner. There were no ads with the lessons that I could see. But PetraLingua has generously offered all MommyMaestra readers a special discount! Now through May 31st, all MM readers will receive 25% off a subscription. Simply type in the discount code: PL_MM25. If you have any questions about the program, leave a comment below or contact me and I’ll get you an answer. Disclosure: PetraLingua is a new MommyMaestra sponsor. They provided me free access to their site for this review. All opinions expressed above, however, are my own. Can you log in two or more at the same time? What a great resource! Looking forward to checking them out. Thanks! Great!!! This looks very entertaining. My niece would love it! This is an awesome resource. Thanks for sharing and congrats on the sponsorship. I was talking to a mom of 3 here in Miami and she was looking for something like this. I wish I would have done this with my son when he was little. As long as it is entertaining, I'm sure it will be beneficial to the kids. I can only find the english version for android.. where have others downloaded it from? Thank yku btw for all of the helpful reviews! Yes, I like the songs, but I 've found only the online version of the course, not the application for androids (actually there is one free lesson available but not the whole course!) It's a pity!